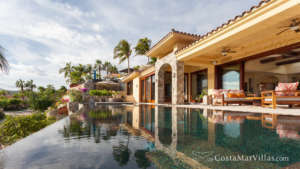 Stunning blue waters crashing onto quiet sandy shores and vistas that span the Cortez and span outward to meet the horizon; these are some of the things that make Casa Milagro the unrivaled ocean oasis it is. Built in the style of grand colonial-era haciendas, the grand decor, evocative architecture and charm are certain to bring guests gently to a bygone time in history. The interior spaces of the villa are reflective of this perspective, replete with deep-toned woods, leather and iron touches, sturdy tile and stone surfaces and truly ornate appointments. The Spanish-style courtyard of Villa Milagro is a vision in green, with palm trees pointing heavenward. A fountain featuring three tiers provides just the right aquatic touch for those in need of real relaxation. Rooms that open to this glorious space are a perfectly calm retreat for all who are lucky enough to enjoy them. All of the six distinct bedroom suits at Milagros are fitted with the finest of linens, luxuriant baths and a character and feel that is impossible to replicate. 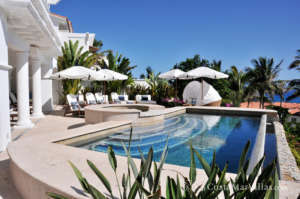 Constructed with lavish entertaining in mind, Milagro caters to and anticipates every need and wish a guest might have. Have a drink at the indoor cocktail bar, invite friends for a wine tasting inside the cellar, enjoy a game of poker or chess in the game room or cheer for your favorite team while watching the massive flat-screen television. The residence also boasts an indoor workout facility with its own treadmill, elliptical machine and a range of free weights. An ideal combination of function and beauty, the high-end kitchen within Villa Milagros contains marble counters, appliances of stainless steel, breakfast bar seating, a pantry and a separate prep sink. The custom cabinets, wood beams and stone hood over the range lend an air of historic appeal, as does the iron chandelier that hangs from the ceiling. Visitors adore the open-concept space that brings the kitchen together with the living area and the large dining table that easily seats 12. A massive fireplace and glass doors that line the entire expanse comprise the perfect point of departure to the impressive terrace just outside. 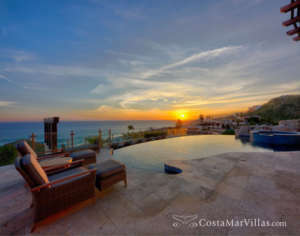 Visitors to Villa Milagro are able to rest beneath the veranda spaces attached to the lounges. There, it is possible to bask in the sweet ocean breeze as well as the ventilation from the fans that hang above. Columns, arches and dramatic white drapery provide much-needed sun protection. The on-site infinity pool offers a grilling spot and a swim-up bar. Lounging platforms sink subtly into the shallow portion of the pool, while Jacuzzi bubbles provide additional interest close by. At night, the fire pit provides a warm glow to accompany the sensory delight of crashing waves on the beach. Casa Milagro really does bring new dimensions to the concept of fine living. Bedroom 1: King bed with full bathroom. Bedroom 2: King bed with full bathroom. Bedroom 3: King bed with full bathroom. Bedroom 4: King bed with full bathroom. Bedroom 5: 2 double beds with full bathroom. Bedroom 6: King bed with full bathroom. **All rates plus a 16% IVA tax and 3% lodging tax.